I’ve been advertising my love for the silicone muffin pan for a while now. This pan has been a game changer for me. I love making Whole 30 compliant egg cups, the ingredient ideas are endless. They are quick and easy, and a great breakfast on the go. After using the pan for a while, I wanted to share a review along with my family’s favorite recipe. I think we all can agree that the pro’s far outweigh the cons for this muffin pan. In fact, it was hard for me to even find a dissatisfaction with this masterpiece of silicone. It really is THAT amazing! Easy to Clean & Dishwasher Safe – I’m busy. I think about 99% of ALL moms are busy. The tasks can seem never ending, so this pan is the perfect solution and will be your best friend. Once you’re finished using them, you can throw it in the dishwasher or rinse with warm soapy water and call it a day. Is there anything better than that?! Accessibility – Once you bake your muffins and let them cool for a minute, they just pop right out. No knives needed. No scraping needed. Muffins stay intact. It is a beautiful thing. No Chemical Smell – Sometimes with silicone you can have the chemical smells during and after you bake. The pan steers clear of that, leaving out any chemical odor and toxins. Lightweight – The last thing you want in your cupboards is another bulky and heavy muffin pan. This pans weighs literally next to nothing and it is so easy to store. Floppy – The one downfall of being so lightweight and made of silicone, is that it is very floppy. I wouldn’t recommend storing this with your heavy pans. Must use a cookie sheet underneath – To avoid any spilling or other baking errors, you will have to place the silicon pan on top of a cookie sheet. You want the muffin pan to remain steady and even. Now that we’ve covered the basics and why I love this pan so much, I wanted to share a family favorite recipe. The girls love when I make breakfast muffins. They are so easy to prepare, bake and store in the refrigerator so you can have breakfast on the go! The possibilities are endless when you create egg muffins! Slice tomatoes and spinach then combine with eggs. Let cool, pop out of muffin pan and enjoy! Do you have the Silicone Muffin Pan? Do you love it?! 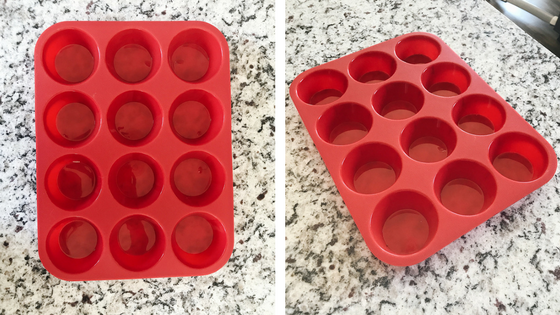 What is your go-to recipe using the muffin pan?